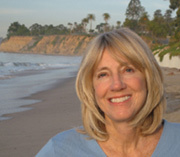 Polly Caldwell Bookwalter is the author and illustrator of both Butterfly Beach and The Keeper of Butterfly Beach. She is the mother of two adult children, a grandmother, and a former teacher. With her husband Roger, she divides her time between the central coast of California, northern Michigan, and the south of France. When not writing or painting, she may often be found walking along Butterfly Beach, smiling and looking for the butterflies!